Native Phα1β is a peptide purified from the venom of the armed spider Phoneutria nigriventer that has been shown to have an extensive analgesic effect with fewer side effects than ω-conotoxin MVIIA. Recombinant Phα1β mimics the effects of the native Phα1β. Because of this, it has been suggested that Phα1β may have potential to be used as a therapeutic for controlling persistent pathological pain. The amino acid sequence of Phα1β is known; however, the exact structure and disulfide arrangement has yet to be determined. Determination of the disulfide linkages and exact structure could greatly assist in pharmacological analysis and determination of why this peptide is such an effective analgesic. Here, we used biochemical and mass spectrometry approaches to determine the disulfide linkages present in the recombinant Phα1β peptide. Using a combination of MALDI-MS, direct infusion ESI-MS, and nanoLC-MS/MS analysis of the undigested recombinant Phα1β peptide and digested with AspN, trypsin, or AspN/trypsin, we were able to identify and confirm all six disulfide linkages present in the peptide as Cys1-2, Cys3-4, Cys5-6, Cys7-8, Cys9-10, and Cys11-12. These results were also partially confirmed in the native Phα1β peptide. These experiments provide essential structural information about Phα1β and may assist in providing insight into the peptide’s analgesic effect with very low side effects. The online version of this article ( https://doi.org/10.1007/s13361-018-1904-3) contains supplementary material, which is available to authorized users. The spiders of the genus Phoneutria are members of the family Ctenidae, suborder Labdognata, and order Araneidae. They inhabit forests of the neotropical region from Southern Central America (Costa Rica) throughout South America, from the East of the Andes to the North of Argentina. The genus comprises the largest known true spiders, considering their size and weight. In Brazil, they are also known as “armed spiders,” because they display an “armed” position when threatened. The species Phoneutria nigriventer are the most important species of the genus Phoneutria, when considering clinical significance. The venom of this aggressive spider is highly toxic and it is the most studied among the venoms of Phoneutria species. An initial fractionation procedure of the venom, using gel filtration and reversed-phase chromatography, monitored by the assessment of lethal activity and toxic effects, yielded four distinct families of neurotoxic polypeptides, named PhTx1, PhTx2, PhTx3, and PhTx4. The purified fraction PhTx3 contains six neurotoxic peptide isoforms, PnTx3-1 to 6 . The fraction PhTx3-6 has antinociceptive effects  and was patented with the name of Phα1β. It reversibly and non-specifically inhibits high-voltage-activated Ca2+ channels, namely L-(Cav1.2), N-(Cav2.2), P/Q-(Cav2.1), and R-(Cav2.3) type, with varying potency (N > R > P/Q > L), in heterologous and native systems . Phα1β toxin can be overexpressed and purified from in Escherichia coli in a recombinant form that shares all the analgesic properties of the native toxin . It has been demonstrated that the Phα1β peptide is more effective and potent as an analgesic than ω-conotoxin MVIIA and produces far less side effects . Because of this, it has been suggested that Phα1β may have potential to be used as a therapeutic for controlling persistent pathological pain, such as cancer pain . The amino acid sequence of Phα1β is known; however, the exact structure and disulfide arrangement has yet to be determined. Determination of the disulfide linkages and exact structure could greatly assist in pharmacological analysis and determination of why this peptide is such an effective analgesic. Historically, disulfide linkages within proteins and peptides have been determined using a combination of chromatography (i.e., reversed-phase chromatography) under non-reducing and reducing conditions, followed by N-terminal sequencing, and the free, reduced cysteines were identified by Ellman’s reagent (DTNB) . Other methods such as a combination of gel filtration, high-performance liquid chromatography and peptide mapping by paper high-voltage electrophoresis in one direction and paper chromatography in the second dimension , or chemical and enzymatic digestion followed by 2D gel electrophoresis under non-reducing and reducing conditions were also useful . Recently, mass spectrometry has become the method of choice for determination of disulfide linkages within proteins and peptides [8, 9]. Specifically, combinations of nanoliquid chromatography-tandem mass spectrometry (nanoLC-MS/MS) with direct infusion electrospray ionization mass spectrometry (ESI-MS) or matrix-assisted laser desorption ionization mass spectrometry (MALDI-MS) of the trypsin, AspN, or chymotrypsin and/or a combination of them became the investigators’ first choice in disulfide assignment in proteins and peptides. Here, we used biochemical and mass spectrometry approaches to determine the disulfide linkages present in the recombinant Phα1β peptide. Using a combination of MALDI-MS, direct infusion ESI-MS, and nanoLC-MS/MS analysis of the undigested Phα1β peptide and peptide digested with AspN, trypsin, or AspN/trypsin, we were able to identify and confirm all six disulfide linkages present in the peptide as Cys 1–2, Cys 3–4, Cys 5–6, Cys 7–8, Cys 9–10, and Cys 11–12. These experiments provide essential structural information about Phα1β and may assist in providing insight into the peptide’s analgesic effect with very low side effects. All reagents were purchased from Sigma-Aldrich, Waters Corp., or Fisher Scientific, unless otherwise stated. The recombinant version of Phα1β was synthesized by Giotto Biotech (www.giottobiotech.com) and was expressed in E. coli. It was purified through a proprietary production process, with a combination of ion exchange and size exclusion chromatography. The yield of the process was 0.5 mg/ml. The peptide’s MW is 6045.12 Da (average mass) and 6040.58 (monoisotopic mass). The native Phα1β peptide was purified by a combination of gel filtration, reversed-phase FPLC/FPLC, and ion exchange HPLC, as previously described . Both the native Phα1β and the overexpressed, recombinant Phα1β are 55 amino acid peptides with the amino acid sequence ACIPRGEICTDDCECCGCDNQCYCPPGSSLGIFKCSCAHANKYFCNRKKEKCKKA. The Phα1β recombinant and the natural Phα1β peptide also have in the N-terminal a signal sequence (native peptide) and methionine (recombinant peptide), both removed during expression. Digestion of Phα1β peptide was carried out in solution. Two hundred microliters of 80 mM Tris HCl, pH 7.8, was added to 200 μg of dry peptide. The solution was pipetted up and down, vortexed, and sonicated for 15 min. The peptide did not fully go into solution, so another 200 μl of buffer was added and was again pipetted, vortexed, and sonicated as before. This was repeated once more so the final concentration was 0.3 μg/μl (200 μg/600 μl). Fifty microliters of 6 M urea was added for a final urea concentration of 0.75 M. The solution was pipetted, vortexed, and sonicated as before. Two micrograms of AspN (cleavage at N-terminus of D and E residues) was added to 150 μg of peptide (487.5 μl of solution), and 5 μg of trypsin (cleavage at C-terminus of R and K residues) was added to 200 μg of peptide (650 μl of solution). These were allowed to digest overnight (16–18 h) at 37 °C. Fifty micrograms of peptide (162.5 μl of solution) was left undigested. The undigested peptide was zip tipped using 1000 μg–200 μl capacity C18 TopTips from Glygen. The sample was completely dried using a SpeedVac evaporator and then rehydrated in 0.1% formic acid (FA) and sonicated for 15 min. The sample was then resolublized in 100 μl 0.1% FA and sonicated for 15 min (Glygen TopTip Procedure). The TopTip was gently tapped to displace any packing material that may have been stuck to the cap. The caps were removed from the top and bottom of the tip and 50 μl of 50% ACN + 0.1% FA was added to the top of the TopTip via a pipette tip inserted in the top of the TopTip. This solution was forced through the packed bed by attaching the TopTip to the provided syringe and applying air pressure. The TopTip was held while the plunger was pressed during this process to ensure the TopTip did not release from the syringe due to pressure. The TopTip was removed from the syringe and this was repeated three times. The sample solution was loaded and forced through as above, loading the maximum volume allowed (200 μl) or less at a time. The eluate was then reapplied to ensure thorough binding. The packed bed was then washed two times with 50 μl of 0.1% FA. The bound peptides were then eluted from the packed bed with 50 μl of 50% ACN + 0.1% FA. This eluate was then reapplied to elute the maximum amount of peptide. Another 50 μl of 50% ACN + 0.1% FA was added to the tip and forced through the bed and the eluate was again reapplied for maximum peptide recovery. These two 50 μl aliquots were then combined. This sample was then completely dried in the SpeedVac. AspN and trypsin digestions were stopped by adding 100% acetic acid until the pH was between 2 and 4. The samples were then completely dried using a SpeedVac evaporator, and the Glygen TopTip Procedure described above was performed. The samples were then resolublized in 100, 150, and 200 μl of 2% ACN + 0.1% FA for undigested, AspN-digested, and trypsin-digested peptides respectively. Samples were then analyzed using nanoliquid chromatography tandem mass spectrometry. The peptide and/or peptide mixture was analyzed by reversed-phase nanoliquid chromatography tandem mass spectrometry (nanoLC-MS/MS) using a nanoAcuity UPLC (Waters, Milford, MA) coupled to either a Q-TOF Xevo G2 (Waters, Milford, MA) or Q-TOF Ultima API-US mass spectrometer (Waters, Milford, MA) according to published procedures [10, 11, 12, 13] as well as direct infusion mass spectrometry using a Q-TOF Xevo-G2 mass spectrometer (Waters, Milford, MA). For the analysis using the Q-TOF Ultima API, the peptides were loaded onto a 150 μm × 100 mm NanoAquity BEH130 C18 1.7-μm UPLC column (Waters, Milford, MA) and eluted over a 150-min gradient at a flow rate of 300 nl/min as follows: 1–45% organic solvent B (ACN containing 0.1% FA) over 1–20 min, 45–85% B (20–80 min), 85% B constant (80–120 min), 85–1% B (120–135 min), and finally remain at initial conditions of 1% B (135–150 min). The aqueous solvent A was 0.1% FA in HPLC water. The column was coupled to a fused silica tube emitter tip for the nano-electrospray option (Waters, Milford, MA). The MS data acquisition consisted of survey 1 s MS scans in the m/z range 350–1800 and automatic data-dependent analysis (DDA) of the top 5 highest intensity ions with charge of 2+, 3+, 4+, or 5+. The MS/MS, which was obtained over m/z 50–1800, was triggered when MS signal intensity exceeded 10 counts/s. In the survey MS scans, the five most intense peaks were selected for collision-induced dissociation (CID) and were fragmented until the total MS/MS ion counts reached above 10,000 counts/s or for up to 6.3 s each. The peptides were then eluted over a 60-min gradient at a flow rate of 300 nl/min as follows: 1–45% organic solvent B (ACN containing 0.1% FA) over 1–37 min, 45–85% B (37–40 min), 85% B constant (40–47 min), 85–1% B (47–50 min), and finally remain at initial conditions of 1% B (50–60 min). The aqueous solvent A was 0.1% FA in HPLC water. The column was coupled to a fused silica tube emitter tip for the nano-electrospray option (Waters, Milford, MA). The MS data acquisition consisted of survey 1 s MS scans in the m/z range 350–1600 and automatic DDA of the top 5 highest intensity ions with charge of 2+, 3+, or 4+. The MS/MS, which was obtained over m/z 50–1900, was triggered when MS signal intensity exceeded 10 counts/s. In the survey MS scans, the five most intense peaks were selected for CID and were fragmented until the total MS/MS ion counts reached above 999,999 counts/s or for up to 6.3 s each. The peptides were then eluted over the same 60-min gradient and system setup as previously described in (b). The MS data acquisition consisted of survey 1 s MS scans in the m/z range 300–2200 and automatic DDA of the top 5 highest intensity ions with charge of 2+, 3+, 4+, 5+, or 6+. The MS/MS, which was obtained over m/z 50–1900, was triggered when MS signal intensity exceeded 10 counts/s. In the survey MS scans, the five most intense peaks were selected for CID and were fragmented until the total MS/MS ion counts reached above 999,999 counts/s or for up to 6.3 s each. MS/MS peak selection using an inclusion list was enabled to preferentially select all peaks that were on the inclusion list. The inclusion list consisted of all potential m/z up to the 9+ charge state for the peptide after an AspN digestion. Peaks that were within ± 200 mDa of the entries on the inclusion list were included. The retention time window was ± 10 s.
The peptides were then eluted over the same 60-min gradient and system setup as previously described in (b). The MS data acquisition was the same as that described in (c). Rather than enabling MS/MS peak selection using an inclusion list to preferentially select peaks that were on the inclusion list, MS/MS peak selection using an inclusion list was enabled to ONLY select peaks that were on the inclusion list. The inclusion list consisted of all potential m/z up to the 9+ charge state for the peptide after a trypsin digestion. All other parameters remained the same. The peptides were then eluted over a 120-min gradient at a flow rate of 300 nl/min as follows: 1–55% organic solvent B (ACN containing 0.1% FA) over 1–70 min, 55–85% B (70–85 min), 85% B constant (85–95 min), 85–1% B (95–105 min), and finally remain at initial conditions of 1% B (105–120 min). The same instrument setup as previously described in (a) was used. The MS data acquisition consisted of survey 1 s MS scans in the m/z range 300–2200 and automatic DDA of the top 5 highest intensity ions with charge of 2+, 3+, or 4+. The MS/MS, which was obtained over m/z 50–1900, was triggered when MS signal intensity exceeded 10 counts/s. In the survey MS scans, the five most intense peaks were selected for CID and were fragmented until the total MS/MS ion counts reached above 999,999 counts/s or for up to 6.3 s each. MS/MS peak selection using an inclusion list was enabled to preferentially select all peaks that were on the inclusion list. The inclusion list consisted of all potential m/z up to the 9+ charge state for the peptide after an AspN digestion. Peaks that were within ± 300 mDa of the entries on the inclusion list were included. The retention time window was ± 10 s.
For the analysis using the QTOF Xevo G2, the peptides were loaded onto a 150 μm × 100 mm NanoAquity BEH130 C18 1.7-μm UPLC column (Waters, Milford, MA) and eluted over a 60-min gradient at a flow rate of 600 nl/min as follows: 1–50% organic solvent B (ACN containing 0.1% FA) over 1–31 min, 50–85% B (31–33 min), 85% B constant (33–36 min), 85–1% B (36–37 min), and finally remain at initial conditions of 1% B (37–60 min). The aqueous solvent A was 0.1% FA in HPLC water. The column was coupled to a Picotip Emitter Silicatip nano-electrospray needle (New Objective, Woburn, MA). The MS data acquisition consisted of survey 1 s MS scans in the m/z range 350–2000 and automatic DDA of the top 6 highest intensity ions with charge of 2+, 3+, 4+, 5+, and 6+. The MS/MS, which was obtained over m/z 50–2000, was triggered when MS signal intensity exceeded 500 intensity/s. In the survey MS scans, the top 6 most intense peaks were selected for CID and were fragmented until the total MS/MS ion counts reached above 3000 intensity/s or for up to 7.0 s each. The intact peptide was then analyzed by direct infusion ESI-Q-TOF MS using the Xevo G2 previously mentioned. A flow rate of 400 nl/min was used. MS was acquired over m/z 100–2000. A scan time of 1 s was used. MS/MS was collected for the individual peaks with m/z 862, 1005, 1069, 1206, 1508, and 1069. All instruments were calibrated using 1 pmol Glu-fib, (Waters, Milford, MA), prior to sample being run. Saturated HCCA matrix solution was prepared in 50% acetonitrile/50% nanopure water with 0.1% TFA. One microliter of the peptide samples was mixed with 1 μl of the matrix before being spotted onto the Bruker MTP 384 ground steel plate and then the mixture was air-dried at room temperature. MALDI-MS and MS/MS measurements were accomplished using the Bruker UltrafleXtreme MALDI TOF/TOF mass spectrometer (Bruker Daltonics). In the MALDI-MS analysis, ions were ionized by a Smartbeam II laser (modified Nd:YAG laser). After laser ionization, ions were accelerated by a 19.5-kV electric field into the field-free flight tube and were detected in the positive reflectron mode. In the MALDI-MS/MS analysis, laser-induced dissociation (LID) was used to fragment the peptides (LIFT mode with no added gas). MALDI-MS/MS data of the reduced peptide with m/z 3212 was analyzed through Biotools software (Bruker Daltonics) with Mascot server to yield the corresponding sequence. All sequences were from Uniprot database (http://www.uniprot.org/). Sequence alignments were performed using HHalign algorithm implemented in Clustal-Omega . The default transition matrix (Gonnet) and scoring functions (gap opening penalty—6 bits, gap extension—1 bit) were used. The alignments were visualized using Jalview . Disulfide bonds were assigned manually using MassLynx Software Version 4.0 along with Protein Prospector (http://prospector.ucsf.edu/prospector/cgi-bin/msform.cgi?form=msproduct). The raw data and any additional information regarding the experiments presented will be available upon request, according to Clarkson University’s Material Transfer Agreement policy. The theoretical neutral molecular mass of the Phα1β peptide with all 12 cysteine residues reduced is 6040.58 Da, while the theoretical mass of the same peptide with all cysteines oxidized and involved in disulfide bridges is 6028.58 Da. To determine whether the cysteine residues are reduced or linked as disulfide bridges, we analyzed the intact, non-reduced peptide both by electrospray ionization mass spectrometry using direct infusion and by nanoLC-MS/MS. We found peaks with m/z of 862.23 (7+), 1005.76 (6+), 1206.72 (5+), and 1508.12 (4+) that corresponded to the mass of the peptide, minus 12 Da due to the six disulfide bridges (Figure 1). Therefore, Phα1β peptide contains no free cysteine and all cysteine residues are disulfide-linked. The first piece of evidence that the first eight Cys residues are disulfide-linked came from nanoLC-MS/MS analysis of the Phα1β peptide digested with trypsin, where we identified a peak with m/z of 1198.12 (3+), which corresponded to peptide ACIPRGEICTDDCECCGCDNQCYCPPGSSLGIFK, with all Cys residues intramolecular disulfide-linked. The MS/MS fragmentation of this peak confirmed the amino acid sequence of the peptide listed earlier and that the Cys residues from this peptide are indeed intramolecular disulfide-linked (Figure 2a). Our data was also confirmed by detection of a peak with m/z of 1204.25 (3+), which corresponded to tryptic peptides ACIPR and GEICTDDCECCGCDNQCYCPPGSSLGIFK bound in an intermolecular disulfide bridge between the first and the next seven Cys residues. The MS/MS fragmentation of this peak produced a series of b and y and internal ions from both peptides which corresponded to the amino acid sequence of the two peptides disulfide-linked (Figure 2b). We also tried to determine the disulfide linkages by direct infusion ESI-MSMS of the intact Phα1β peptide, but the disulfide-linked Phα1β peptide did not fragment well (Supplemental Figure 1). However, the peptide fragments in smaller pieces and keeps the cysteines disulfide-linked. Therefore, we reasoned that if we find the same disulfide bridges in these truncated peptides, this information could help us in determining the disulfide bridges of the intact peptide. In a nanoLC-MS/MS analysis of the undigested peptide, we found a precursor ion with m/z of 1068.68 (3+), which corresponded to peptide ACIPRGEICTDDCECCGCDNQCYCPPGSSLG with all Cys residues disulfide-linked (Figure 2c). MS/MS fragmentation of this peak produced a series of b and y ions and of internal ions that confirmed the amino acid sequence of the identified peptide (Figure 2c). The MS/MS of this 1068.68 (3+) precursor was identified in multiple nanoLC-MS/MS experiments (data not shown). This data further confirmed the nanoLC-MS/MS experiments of the tryptic digests that the first eight cysteine residues are disulfide-linked. Since we clearly demonstrated that (1) the intact peptide has all 12 Cys residues intramolecularly disulfide-linked and (2) the first eight Cys residues are also intramolecularly disulfide-linked, this suggests that the last four Cys are also intramolecularly disulfide-linked. To confirm the disulfide linkages between the cysteines detected by direct infusion ESI-MS and nanoLC-MS/MS experiments, we analyzed by MALDI-MS the Phα1β peptide either undigested or digested with trypsin or AspN. MALDI-MS analysis of the intact and truncated Phα1β peptide identified a series of peaks that corresponded to intact peptide (m/z 6027.82), in agreement with the theoretical mass of the peptide (6040.58 Da) with all 12 cysteines disulfide-linked (6028.58 Da) and also in agreement with the m/z of this peptide determined by direct infusion ESI-MS for the peaks with charge states of 4+, 5+, 6+, and 7+, reported earlier in Figure 1. In the MALDI-MS spectrum, we also observed a peak with m/z 3204.19 (1+), which corresponded to peptide ACIPRGEICTDDCECCGCDNQCYCPPGSSLG, with all of its cysteines disulfide-linked. Note that we have already identified this peptide in nanoLC-MS/MS experiments of the undigested peptide (Figure 2c). To further confirm that this peptide contains all eight cysteines disulfide-linked, we analyzed this peak under non-reducing and reducing conditions. As observed, this peak shifted from m/z 3204 to m/z 3212, further demonstrating that the first eight cysteines are disulfide-linked (Figure 3a, insert). MALDI-MSMS analysis of the peak with m/z 3212 (reduced peptide) provided additional evidence that peak with m/z 3204.19 (1+) corresponded to peptide ACIPRGEICTDDCECCGCDNQCYCPPGSSLG (Figure 3b), thus confirming our initial findings shown in Figure 2c that the first eight cysteines are disulfide-linked. Since analyses of peptide fragments were useful in assignment of the disulfide linkages, we also looked in the MALDI-MS spectrum for additional peaks that could aid us in determination of the disulfide linkages within Phα1β peptide. We found a peak with m/z 3592.35 (1+) which corresponded to peptide ACIPRGEICTDDCECCGCDNQCYCPPGSSLGIFK and a peak with m/z of 3016.05 (1+) which corresponded to peptide ACIPRGEICTDDCECCGCDNQCYCPPGSS-H2O, both peptides with all cysteines intramolecularly disulfide-linked (Figure 3a). All these peptides had the first eight cysteines disulfide-linked (Figure 3a). Therefore, the first eight Cys residues are all disulfide-linked and the last four Cys residues are also all disulfide-linked. Our conclusion that the first eight Cys residues are disulfide-linked with each other (i.e., none of the first eight Cys are connected to the last four Cys) allowed us to restrict the investigation of the Cys linkages to the first eight of them. Therefore, we pursued the investigation of the disulfide linkages within the first eight Cys residues. The first disulfide bridge that we identified was an intramolecular disulfide bridge between Cys 1 and Cys 2. In an AspN digestion, we found a peak with m/z of 588.24 (2+) which corresponded to peptide ACIPRGEICTD with Cys 1 and Cys 2 disulfide-linked (Figure 4a). MS/MS fragmentation of the peak with m/z of 588.24 (2+) (Figure 4a) produced a series of b and y and internal peaks that confirmed the amino acid sequence of this peptide, with the first two Cys residues disulfide-linked. Some of these product ions within the MS/MS spectrum of peak with m/z of 588.24 (2+) such as peaks with m/z of 1042.45 (1+), 941.40 (1+), and 922.39 (1+) corresponded to b10, b9, and b9 + H2O, all with Cys residues disulfide-linked (i.e., 2 Da lower than the theoretical m/z of these ions). This data was nicely complemented by identification of y2 ions, but not of y3, y4, or y5, which should not be observed at their expected m/z, further demonstrating that the Cys1 and Cys2 residues are disulfide-linked. Additional evidence that Cys 1 and Cys 2 are disulfide-linked came from identification of an intermolecular bridge from a nanoLC-MS/MS of an AspN digest. Specifically, we found a peak with m/z of 539.76 (2+) which corresponded to peptides ACIPRG and EICT intermolecularly disulfide-linked. The MS/MS fragmentation of this peak produced some b and y ions from both peptides that confirmed that these two peptides are disulfide-linked (Figure 4b). Taken together, our data suggests that Cys 1 and Cys 2 are disulfide-linked. Since the first eight Cys are disulfide-linked and Cys 1–2 are also disulfide-linked, this suggests that Cys 3 to Cys 8 are also disulfide-linked. Since we determined that the Cys 1 and Cys 2 are disulfide-linked and that the first eight Cys are also disulfide-linked, we sought to determine the disulfide linkage in Cys 3 to Cys 8. In nanoLC-MS/MS analysis of the Phα1β peptide digested with AspN, we found a peak with m/z of 863.36 (2+) which corresponded to unmodified peptide DNQCYCPPGSSLGIFK (calculated m/z of 864.88 (2+)) that had the Cys 7 and Cys 8 disulfide-linked (Figure 5a). We also found a peak with m/z of 879.34 (2+) that corresponded to peptide DNQCYCPPGSSLGIFK modified by 32 Da (also with the Cys 7 and Cys 8 disulfide-linked; Figure 5b). This 879.34 (2+) peak had a mass increase of the precursor ion with 32 Da, as compared with the theoretical mass of the peptide, with the cysteines disulfide-linked. Such modification is most likely a dihydroxylation or oxidation of one of the two proline residues to glutamate, a trisulfide bond (additional sulfur in disulfide bond), or a modification of tyrosine residue to 3,4,6-trihydroxy-phenylalanine (TOPA). MS/MS fragmentation of the precursor ions with m/z of 863.36 (2+) and 879.38 (2+) produced a series of b and y ions (b2, b3, b11 + H2O, b14 − 2H2O, y2, y4, y9, and y10), as well as a few internal ions that led to identification of this peptide, with the Cys residues disulfide-linked. In addition, identification of the b11 + H2O and b14 − 2H2O with cysteine residues disulfide-linked strengthened our conclusion that these two cysteines are disulfide-linked. Since we could easily observe in the MS/MS spectrum y9 (PGSSLGIFK) and y10 (PPGSSLGIFK) ions which contained unmodified proline residues, this suggests that the modification in this peptide was most likely due to formation of TOPA on the tyrosine residue. These two peaks were also identified in a different experiment (Supplemental Figure 2A & B). Another peak with m/z 895.82 (2+) was identified in a AspN digest, which corresponded to peptide DNQCYCPPGSSLGIFK that had the Cys 7 and Cys 8 disulfide-linked, but modified by 64 Da (calculated m/z of 864.88 (2+) (Supplemental Figure 2C). The MS/MS fragmentation of these three precursor ions produced an almost identical fragmentation pattern and similar to the ones shown in Figure 5a, b, further confirming that peptide DNQCYCPPGSSLGIFK has the Cys 7 and Cys 8 disulfide-linked. Because (1) the first eight Cys residues are disulfide-linked, (2) Cys 1 and Cys 2 are disulfide-linked, and (3) Cys 7 and Cys 8 are also disulfide-linked, this suggests that Cys 3 to Cys 6 are also disulfide-linked. We have already determined that the last four Cys (Cys 9 to Cys 12) are disulfide-linked. However, we did not have any information about how are these Cys residues linked. The answer to our question came from nanoLC-MS/MS analysis of the Phα1β peptide digested with AspN. Specifically, we found a peak with m/z of 676.26 (4+) that corresponded to peptide DNQCYCPPGSSLGIFKCSCAHANKY (calculated m/z 677.28 (4+)), with all four Cys residues (Cys 7 to Cys 10) disulfide-linked (calculated m/z 676.28 (4+)) (Figure 5). MS/MS fragmentation of the 676.26 (4+) peak produced a series of peaks including b2, y2, y3, y4, and the internal ions PPGSSLG and PPGSSLGI that confirmed the amino acid sequence of peptide DNQCYCPPGSSLGIFKCSCAHANKY, with all four Cys residues disulfide-linked (Figure 5c). This MS/MS was found multiple times in multiple experiments. Additional evidence that Cys 7 to Cys 10 are disulfide-linked came from identification of a peak with m/z 1044.84 (2+), which corresponded to peptide DNQCYCPPGSSLGIFKCSCA, with Cys 7 to Cys 10 disulfide-linked (Supplemental Figure 3). While the MS/MS spectrum did not have a good series of ions, we could still find b2 and b3 ions and the internal fragment PPGSSLGI, which could be a good indication that this identification is a true positive. Since we have already determined that Cys 7 and Cys 8 are disulfide-linked, now we provide additional evidence that these two Cys residues are indeed disulfide-linked. In addition, we also can infer that Cys 9 and Cys 10 are disulfide-linked. Furthermore, identification of an internal fragment GIFKCSCAHA that contained the Cys 9–Cys 10 disulfide-linked further confirmed that these Cys 7 to Cys 10 are disulfide-linked, and that (1) Cys 7–Cys 8 are disulfide-linked and (2) Cys 9–Cys 10 are also disulfide-linked. Lastly, since we have demonstrated that (1) Cys 9–Cys 10 are disulfide-linked (Figure 4b), (2) Cys 1 to Cys 8 are disulfide-linked, and (3) Cys 9 to Cys 12 are also disulfide-linked, this suggests that Cys 11 and Cys 12 are also disulfide-linked. In our initial MALDI-MS experiments (Figure 3a), we identified a series of peaks that corresponded to (N-terminal) truncated peptide with cysteines disulfide-linked. Examples of such peaks include peak with m/z 3592.35 (1+), which corresponded to peptide ACIPRGEICTDDCECCGCDNQCYCPPGSSLGIFK, m/z 3204.19 (1+) which corresponded to peptide ACIPRGEICTDDCECCGCDNQCYCPPGSSLG, and m/z 3016.05(1+) which corresponded to peptide ACIPRGEICTDDCECCGCDNQCYCPPGSS-H2O (all singly charged and with cysteines disulfide-linked and shown in Figure 3a). To further confirm the disulfide linkage within some of these peaks observed, we subjected peaks with m/z 3592.35 (1+) and 3204.19 (1+) to MALDI-MS/MS analysis (Figure 6a, b). MS/MS of peak with m/z 3592.35 (1+) which corresponded to peptide ACIPRGEICTDDCECCGCDNQCYCPPGSSLGIFK with first eight Cys disulfide-linked produced a series of peaks that corresponded to peptides that contained all eight Cys (m/z 3463.9, 2589.7), or Cys 1–2 (m/z 1271.7 and 1155.7) disulfide-linked (Figure 6a). Furthermore, MS/MS of the precursor ion with m/z 3204.19 produced a series of ions that corresponded to peptides containing the first eight Cys (m/z 3106.04, 3016.19, and 2592.95), first four Cys (m/z 1605.21), and Cys 1–2 (m/z 940.95) disulfide-linked (Figure 6b). Since we found (1) a peak (m/z 1605.21) that corresponded to peptide ACIPRGEICTDDCEC with first four Cys (Cys 1 to 4) disulfide-linked and (2) a peak (m/z 940.95) that corresponds to peptide ACIPRGEIC with Cys1–2 disulfide-linked and (3) we know that Cys 1–2 are disulfide-linked (Figure 4) and Cys 3 to Cys 6 are also disulfide-linked (see earlier text), this suggests that Cys 3–4 are disulfide-linked and Cys 5–6 are also disulfide-linked. Taken together, our MALDI-MS analysis further confirmed the direct infusion ESI-MS and nanoLC-MS/MS experiments and also provided additional information that Cys 3–4 are disulfide-linked and Cys 5–6 are also disulfide-linked. In addition, all MALDI-MS, ESI-MS, and nanoLC-MS/MS data are in agreement that Cys 1–2 are disulfide-linked, Cys 3–4 are disulfide-linked, Cys 5–6 are disulfide-linked, Cys 7–8 are disulfide-linked, Cys 9–10 are disulfide-linked, and Cys 11–12 are also disulfide-linked. The m/z as determined by MALDI-MS for the intact recombinant (m/z 6029.68 (1+)) and native (m/z 6029.90 (1+)) Phα1β peptides (Figure 7a, b) indicates a good agreement that both peptides have all their 12 cysteines disulfide-linked. In addition, peaks with m/z of 3591.21 (1+), 3204.01 (1+), and 3015.49 (1+) (Figure 7a) correspond to truncated recombinant peptides ACIPRGEICTDDCECCGCDNQCYCPPGSSLGIFK, ACIPRGEICTDDCECCGCDNQCYCPPGSSLG, and ACIPRGEICTDDCECCGCDNQCYCPPGSS (all N-terminal peptides), with all first eight cysteines disulfide-linked. Alternatively, peak 3015.90 could be the doubly charged intact peptide. In addition, inspection of the MALDI-MS spectrum of the native peptide (Figure 7b) also indicates that not only the recombinant, but also the native Phα1β peptide is fragmented in a similar way: it loses the C-terminus (it is not clear whether it has a functional significance). At least one peak from the MALDI-MS spectrum of the native peptide (m/z 3015.94 (1+)) corresponds to peptide ACIPRGEICTDDCECCGCDNQCYCPPGSS with all eight Cys disulfide-linked (Figure 7b). This behavior of both recombinant and native Phα1β peptide may suggest a possible functional role of maintaining the N-terminal intact, or losing the C-terminal, or both. However, more important for the current study, it suggests that both the recombinant and native Phα1β peptides have a similar disulfide pattern. Clearly, at least the first eight cysteines from the native peptide are disulfide-linked and the last four cysteines are also disulfide-linked. We then sought to obtain additional information on the recombinant and native Phα1β peptides by analyzing them by MALDI-MS/MS (Figure 8a, b). The MS/MS of both peptides did not look great due to poor fragmentation. However, we observed that fragmentation of both peptides produced at least two identical fragments that we could identify. One of them had m/z 1233.26 (1+) (recombinant peptide) and m/z 1233.56 (1+) (native peptide) and corresponded possibly to peptide YCPPGSSLGIFK-NH3 or FKCSCAHANKY-H2O (with cysteines disulfide-linked). The second fragment had m/z of 2133.82 (1+) (recombinant peptide) and m/z 2134.02 (1+) (native peptide) and corresponded possibly to peptide CIPRGEICTDDCECCGCDNQ-2H2O and with cysteines disulfide-linked. While only two matched fragments are not ideal, it still helps in suggesting that at least the recombinant and native peptides have a similar behavior, both when they are truncated (Figure 7a, b). 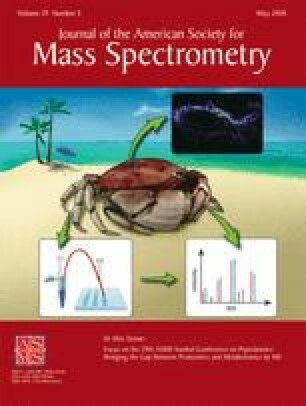 Additional MALDI-MS and MALDI-MS/MS spectra are provided in Supplemental Figures 4–7, where the disulfides identified for the recombinant and native peptides further confirmed the results of our experiments presented in Figures 3 and 7. The predicted structure of the Phα1β peptide indicates that all cysteines are disulfide-linked except two, Cys 3 and Cys 6 (Figure 8). The specific disulfide linkages expected based on the predicted structure are Cys 1–5, Cys 2–7, Cys 4–10, Cys 8–9, and Cys 11–12 (Figure 8b). This differs greatly from our results, as we found all cysteines to be disulfide-linked in the manner of Cys 1–2, Cys 3–4, Cys 5–6, Cys 7–8, Cys 9–10, and Cys 11–12 (Figure 8a). The closest sequence homolog with an experimentally determined structure of the Phα1β synthetic polypeptide is spiderine-1a, a classic knottin fold containing polypeptide from Oxyopes takobius. The two sequences share 46% sequence identity. This low level of identity makes homology modeling unreliable for the prediction of high-quality 3D structures required for S–S bridge assignment [16, 17]. Moreover, in the NMR-based 3D structure of spiderine-1a, two of the five disulfide bonds were determined from preliminary structure calculations, while the other three disulfide bonds were assigned based on homology  using ω-oxotoxin-Ol1b from Oxyopes lineatus  as template. Spiderine-1a and ω-oxotoxin-Ol1b share only 14.81% sequence identity, while the level of sequence identity between Phα1β synthetic polypeptide and ω-oxotoxin-Ol1b is 31%. This could be one potential reason why the disulfide pattern we determined experimentally is so different from the predicted models. The MS data collected for the Phα1β synthetic polypeptide not only shows a completely different disulfide bridge pattern compared to the predicted model (Figure 8a), but also shows a totally different S–S bridge pattern compared with the knottin fold containing proteins such as spiderine or other spider toxins targeting calcium (Ca2+) channels (Figure 8b). Whether this different pattern is compatible with the knottin motif is a matter of debate. Variations in disulfide-bonding patterns do not always lead to significant changes in the overall fold . One clear example in this direction is the SMB domain of human vitronectin. The four disulfide bonds in human vitronectin exist in three possible arrangements, including two overlap patterns similar to the knottin fold and one linear pattern, as shown here, for the Phα1β polypeptide. All these arrangements are compatible with the same overall fold and with the PAI-1 binding function [21, 22]. This could suggest the possibility that the Phα1β peptide may exist in different disulfide arrangements while still maintaining the same activity and function. A study performed by our collaborator compared the antinociceptive effects of native Phα1β and recombinant Phα1β on rodent pain models with formalin, a chronic constriction injury, capsaicin, and cancer melanoma. In these pain models, the antihypersensitivity effects that were produced by the native form of Phα1β were fully mimicked by the recombinant version of Phα1β without causing any side effects . The recombinant peptide used in our experiments came from the same batch as was used in this study. While the disulfide bridges determined experimentally were initially focused on the recombinant peptide, one could argue that the native peptide has a different conformation and also a different disulfide pattern. However, in our experiments, we also analyzed the native peptide and found clear evidence that the native peptide, just like the recombinant one, had all cysteines disulfide-linked and that the first eight cysteines were disulfide-bridged; the last four cysteines were also disulfide-bridged. Therefore, again, our data do not support the predicted disulfide linkage for the Phα1β peptide. Striking in this study was the consistent identification of N-terminal fragments of both the recombinant and native Phα1β peptides. This finding somehow suggests that the N-terminal Phα1β peptide may have a consistent, functional role (i.e., antinociceptive), while the C-terminal end may not be required for this antinociceptive activity, but rather possibly an interaction domain for other peptides, either the same or different peptides. This is not the first time when two polypeptides with a similar disulfide pattern in the N-terminal region, but distinct in the C-terminal region, have a different role for the two different N- and C-terminal regions. Clear examples include zona pellucida (ZP) proteins, uromodulin, and vitelline envelope (VE) proteins, which contain a ZP domain with eight cysteines disulfide-linked, in which the N-terminal domain has the first four Cys disulfide-linked (Cys 1–4 and Cys2–3) and is involved in protein polymerization, while the C-terminal domain has different disulfide linkages in different ZP and VE proteins and regulates the interaction of the N-terminal domains [7, 8, 24, 25, 26, 27, 28]. Whether peptide Phα1β has different disulfide bridges in different situations, this remains to be determined. By using 1) nanoLC-MS/MS-, 2) direct infusion ESI-MS- and 3) direct infusion ESIMS/MS-based analysis of the a) undigested, b) tryptically digested, c) AspN digested, and d) AspN/trypsin digested peptide, we have determined that in the synthetic spider peptide Phα1β, all cysteines are disulfide linked. We have determined the specific disulfide linkages to be Cys 1–2, Cys 3–4, Cys 5–6, Cys 7–8, Cys 9–10, and Cys 11–12. The synthetic peptide has identical sequence and displays the same functionality and activity as that of the native peptide and thus can be used as a model for the native peptide. We also determined that in the native peptide, at least the first eight cysteines are disulfide-linked, the last four cysteines are disulfide-linked, and that all 12 cysteines are disulfide-linked. Although the linkages we determined contradict all predicted homology models, it is possible that the peptide exists in different forms containing varying disulfide bond arrangements, while maintaining the same function and activity, as in human vitronectin. The authors thank the members of the lab for fruitful discussions. KLW was supported by the ASPIRE Graduate Student Fellowship through Clarkson University’s CUPO Office. MM was supported by the Fulbright Senior Postdoctoral Fellowship awarded by the Romania-USA Fulbright Commission to MM (guest) and CCD (host). MVG’s work was supported through REDE Fapemig (CBB-RED-00006-14), CNPq (471070/2012-2), Capes Toxinology (AUX-PE 1444/2011), and Fapemig (PPM-00482-15).